If you thought all the “witches” packed it in after extorting candy from you on Halloween night, think again! Oz’s Wicked Witch of the West has nothing on the dreaded “November Witch,” the cruelest witch of all. The November Witch, sometimes phrased “The Witch of November,” is a popular name for the frequent and brutal system of windy storms that come screaming across the Great Lakes from Canada every autumn. The term “Witch of November” was famously used in the song “The Wreck of the Edmund Fitzgerald” by Canadian singer-songwriter Gordon Lightfoot, a poetic tribute to one of the most well-known Great Lakes shipwrecks in recent memory. On November 10, 1975, the SS Edmund Fitzgerald, a massive ore freighter that had once been the largest in its class, sank to the bottom of Lake Superior during a particularly violent autumn gale, killing all 29 of its crew members. Although one of the most infamous, Edmund Fitzgerald is far from the only ship to succumb to the November Witch. The bottoms of all five Great Lakes are littered with thousands of wrecked vessels. More than 6,000 ships were lost on the Great Lakes between the years 1878 and 1897 alone. Over the last 300 years, an estimated 25,000 mariners have lost their lives on the Great Lakes, with the vast majority of those casualties occurring within the icy grip of the November Witch. Source: Jaime McLeod, Old Farmer's Almanac, November 8, 2010. Holden said the haunting 1976 Gordon Lightfoot ballad about the wreck is a big part of the intrigue. “I got a call not too long ago from someone in California wondering if the song was about a real shipwreck or just an interesting folk song he made up,” Holden said. But it’s also the human drama surrounding the wreck, song or no song. There have been thousands of shipwrecks on the Great Lakes, but this is the last one in which lives were lost. The 729-foot freighter left Superior, Wis., on Nov. 9 with a full load of 26,000 tons of Minnesota-made taconite iron ore pellets just before a huge storm engulfed the region. The ore carrier was on its way to a steel mill at Zug Island near Detroit but sunk in waves that some call the largest they’d ever seen on Lake Superior. All 29 crew members on board perished. Late on the afternoon of the 10th, the captain of the Fitzgerald, Ernest M. McSorely, made radio contact with another ship, the Avafor, and reported that Fitz was listing badly to one side, had lost both radars, and was taking heavy seas over the deck in one of the “worst seas” he had ever been in. Northwest winds were blowing near 60 mph with higher gusts. About 4 p.m. an estimated 75-knot (86 mph) hurricane-force northwest wind gust struck the ore carrier Arthur M. Anderson. At 7 p.m. the Anderson, trailing the Fitzgerald by about 10 miles, was struck by two waves estimated at 25 feet or higher. The last radio contact from the Fitzgerald to the Anderson was: “We are holding our own,” about 7:10 that night. But the Fitz’s lights faded from sight in a snow squall and then disappeared from the Anderson’s radar screen minutes later. No distress signal was sent. The wreck was found in two pieces 530 feet below the surface just 17 miles outside Whitefish Point and the relative safety and calmer waters of Whitefish Bay. A Coast Guard investigation ruled the probable cause of the sinking was that the deck hatches failed and water filled the ore-filled cargo holds. This report suggests that Fitzgerald was taking on water due to earlier damage from the storm and that around 7:15 p.m. it plunged headfirst into a large wave and sank abruptly. But findings by the National Transportation Safety Board and the Great Lakes Carriers Association weren’t as sure. Another theory suggests the ship, unknown to the crew, bottomed out in huge waves on a shoal near Caribou Island, gashing the hull and causing buckling on deck. Other theories include structural deficiencies, overloading, hatches that weren’t properly secured, or just freak wind and wave conditions that doomed the ship. Farnquist and Holden said the wreck of the Fitzgerald has become a teaching tool for Great Lakes maritime history, “even though it’s only one of 6,000 shipwrecks on the Great Lakes,” Farnquist noted. “And even though they are just 29 of the thousands of people who have lost their lives on the lakes.” The men who died in the wreck ranged in age from 21 to 63 and came from seven states. The church bell did chime at the Maritime Church in Detroit for the victims, as Lightfoot immortalized in song, but they also are remembered at Whitefish Point, where surviving family and friends gather each year on the anniversary. Source: John Myers, The Duluth News-Tribune, November 10, 2010. I've heard that the reason that Lake Superior never "gives up her dead" is because it's too cold for the bacteria that causes bodies to decompose to live at the bottom of the lake. If true and fish didn't gradually eat the bodies, I suppose they would still be floating around somewhere. WHITEFISH POINT, Mich. – A monster storm was whipping across Lake Superior when the Edmund Fitzgerald sank November 10, 1975. Modern data spells out the severity of the storm, including two intriguing factors. The weather pattern was classic for a big wave-producer on Lake Superior, as high winds build high waves. A storm system formed in Kansas and rapidly intensified as it moved and centered over western Lake Superior.The storm center moved northeast of Lake Superior and brought in a severe northwest wind. Late in the afternoon of November 10, the Arthur Anderson, about eight miles behind the Edmund Fitzgerald, reported an 86 mph wind gust, which is hurricane-force. The forecast at the time could rely only on the very first low-resolution computer models. The forecast was for winds gusting to 57 mph. In 2006, Thomas Hultquist led a study to predict November 10, 1975, weather using higher-resolution computer models. The strongest winds were in the three-hour period just before and after the sinking. A large area of southeast Lake Superior had 50-mph winds or greater. Waves were reported at 25 feet at that time. One key factor was the wind direction, and as a result, wave direction. The Wind and Wave Climate Atlas shows waves over 20 feet high normally move from north to south on eastern Lake Superior. In fact, Edmund Fitzgerald and Arthur Anderson had altered their preferred routes and took more northerly routes across the lake, trying to keep the vessels in smaller waves. The 2006 NOAA model shows waves moving from west to east, however. So, as Edmund Fitzgerald was moving southeast toward the Soo Locks, huge waves were hitting the ship’s starboard quarters from the northwest, the captain of Arthur Anderson later recounted. Another unusual factor that night was a severe wind gust. Arthur Anderson reported an 86 mph wind gust late that afternoon, much higher than the anticipated 57 mph gusts. This was a small-scale situation of increasing severe wind gusts. We tend to think these happen only in summer, during a severe thunderstorm. We had this happen August 2, 2015, when Glen Arbor and Sleeping Bear Dunes were ravaged by 100 mph winds. But very strong wind gusts also can occur along a line of storms in a colder situation. A modern-day computer model animation shows how the waves increased to 25 feet at the time of Edmund Fitzgerald’s sinking. The highest modeled waves were between 4 and 7 p.m. November 10 and the wave forecast model indicates 25.5 foot waves were possible. But those may not have been the biggest waves. The model forecasts the highest significant wave height defined as the average size of the biggest third of waves. Rogue waves are isolated rare waves, and are theorized to be 1.5 to 2 times the significant wave height. Theoretically, it’s possible that a 37-to 52-foot wave, moving from the west, could have come upon the Edmund Fitzgerald sometime between 4 and 7 p.m. The highest estimated wave reported by Arthur Anderson’s captain was 35 feet. Arthur Anderson was struck by two large waves, about 6:30 that night, according to captain Jessie B. Cooper. “I’ve often wondered whether these two particular seas might have been the ones that finally did the Fitzgerald in, because they were really huge,” Cooper said in a 1986 speech as reported in The Wreck of the Edmund Fitzgerald by Frederick Stonehouse. 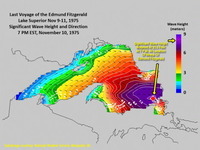 If Fitzgerald had gone along Lake Superior’s southern shore, a more common route, the ship may have encountered different wave movements and reached the protection of Whitefish Point before the strongest winds and highest waves hit. In their attempts to avoid the worst of the storm, the two ships inadvertently steamed into the heart of it, according to David J. Schwab of the University of Michigan Water Center. Schwab co-authored the 2006 NOAA study. “Three hours earlier, three hours later, 10 miles south, 10 miles north, might have made the difference,” Schwab said. As I look at the weather data and try to imagine myself out there on Lake Superior that night, the image in my mind far exceeds the most dangerous situation I've ever experienced. Source: Mark Torregrossa and Garrett Ellison, MichiganLive, November 10, 2015. WHITEFISH POINT, Mich. - Friday marks the 42nd anniversary of the sinking of the Edmund Fitzgerald in Lake Superior. The freighter left Superior, Wis., Sunday, Nov. 9, 1975. It was heading to Detroit, but got caught in a strong Lake Superior November storm. Fitzgerald’s last radio contact was with the freighter Arthur M. Anderson on the evening of Nov. 10. Soon after, Fitzgerald disappeared from radar 17 miles northwest of Whitefish Point. All 29 crew members lost their lives. When Fitzgerald was launched in 1958, it was the largest ship on the Great Lakes. The public is invited to the annual Edmund Fitzgerald memorial ceremony at the Great Lakes Shipwreck Museum at Whitefish Point Friday at 7 p.m. The bell of the ship is rung just once each year, on Nov. 10, in honor of the ship and its men. There also will be a gallery open from noon to 4 p.m. Source: Andrew LaCombe, WLUC, November 10, 2017.